I am interested in purchasing this modular design however I wanted to know if it is permit ready. As the ordering instructions explain, building codes vary from place to place and so we can’t guarantee that the plans will meet code. Contact Structure1.com who has approved my plans and they’ll make sure you can get a permit. Do you have more information about the 6 pod plan? 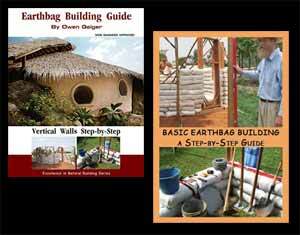 My wife and I like the idea of earthbag homes but would want a home with larger square footage (2000+). You could buy the CAD files and hire a local designer to change the design for you just the way you want. You could add on other designs. Lots of people buy two house designs and make unique combinations. Does that help? Is this a home you’d make via earth bags? Or could this plan be built successfully using straw bale methods? I’ve been looking into both, and like this plan, wasn’t sure if you recommend one over the other for building it. (I live in the PNW just southeast of Seattle if the location would make a difference). You could use either method. Like most of my plans you could use bales, earthbags, cordwood, stone, adobe, etc. Bales are fast and easy and have lots of R-value. Build a post and beam frame, put the roof on, get your rough plumbing and electrical inspections and then set the bales. Include wide roof overhangs so rain doesn’t hit the walls. Do you know a company wich cn deliver this pod houses as prefab system? If you have all the material, bare land but no foundation, 4 workers that work 6 hours a day? If you have all the material, bare land but no foundation, 7 workers that work 6 hours a day? Are there other things that take time except for building process, like waiting for something to dry or stick? A lot depends on the strength and skill level of your workers. I would guess around several weeks to two months. We’ve covered this before on our blog. It is one roofing possibility.